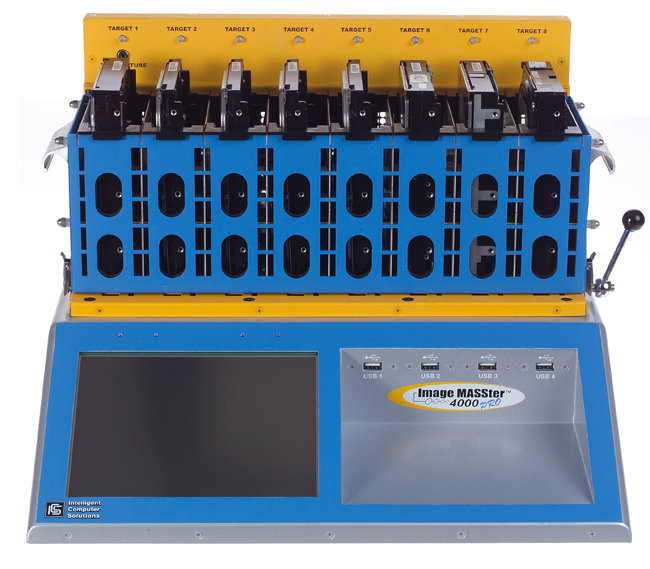 The Image MASSter 4000PRO hard drive duplicator is the next generation of Fast, Reliable and Versatile IT Hard Drive Duplicators, based on the time proven results of the Image MASSter 4000 Product Line. The units versatility allows expanding the units capabilities to support drive interfaces, such as Firewire and SCSI, not commonly supported by other manufacturers. This is the Ideal solution for the mid-size IT organization looking for all the benefits of an enterprise level Duplicator. The IM4000PRO is designed for Ease of Use with a Compact Footprint. 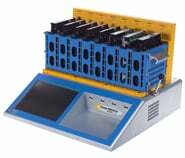 This Versatile Hard Drive duplicator has native support for the high speed duplication of up to eight SAS and SATA drives, and up to four USB drives. In addition, it supports the duplication of IDE*,CF*,uSATA* and eSATA* drives. The unit offers a Cable-Free, Drive Caddy solution for quick and easy drive insertion, minimizing maintenance costs and wear and tear issues associated with use of cables. This unit is designed to support todays High Performance drives, featuring advanced SATA-2 Duplication Technology that can Copy and Wipe drives at speeds exceeding 7GB/min. This advanced technology also prepares the IT User with the hardware necessary to take advantage of tomorrows hard drive speed improvements, having the potential of18GB/min transfer rates. It is also configured with a 1Gbit Ethernet port for Network Connectivity support. The IM4000PRO can also be purchased with Expansion Ready hardware to expand the units capabilities. Expansion Ready units support the use of the Optional IM4000PRO Expansion Box. * 10Gbit PCIe NIC Cards are not supplied by ICS. IMPORTANT NOTE: An External Power Supply, required to supply power to connected SCSI drives is not supplied with the Expansion Box Option. If an External Power Supply is not available, it can be purchased as an accessory. The recommended Power Supply Adapter is the ICS Multi-Output Power Adapter (FGR-0052-000A).